Matt Sheppard sent out one of the biggest winners of his training career when his Ikorodu Road just held on from leading John Smith's Grand National candidate Junior in a dramatic renewal of the Grimthorpe Chase at Doncaster on March 3 and could well be allowed to take his chance in the Scottish Grand National at Ayr at the end of April, writes Elliot Slater. 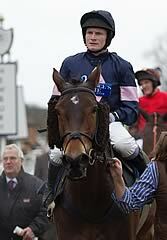 Runner-up on his previous two outings at Doncaster and Newbury, Ikorodu Road had attracted the handicapper's interest and been raised a total of 7lbs for those defeats, but in a quality contest at Town Moor he was still able to race off bottom weight of 10 stone, which included a pound overweight from his jockey Charlie Poste. Never far from the pace in a contest run at a strong gallop, Sheppard's nine-year-old was driven along in pursuit of the clear leader Pentiffic who appeared to have the race in his pocket when 15-lengths clear going down to the second from home. Those who had placed an online horse racing bet will have thought things were in the bag. Pentiffic however began to tire going down to the last and both Ikorodu Road and Junior had closed to within two-lengths when the fading front-runner took a crashing fall and hampered Junior in the process. Seizing his chance Poste drove his charge ahead, but Junior rallied strongly and as they flashed past the post it was difficult to judge who had prevailed. The photo-finish print showed that the bottom weight had prevailed by a short-head from last season's runaway Cheltenham Festival winner who ran a tremendous race in defeat conceding 22lbs. Sheppard suggested that a further rise in his handicap rating as a result of winning the valuable Grimthorpe Chase could well prompt him to run his Ikorodu Road in the Scottish Grand National, the extra mile of which he believes will ideally suit his dour stayer.